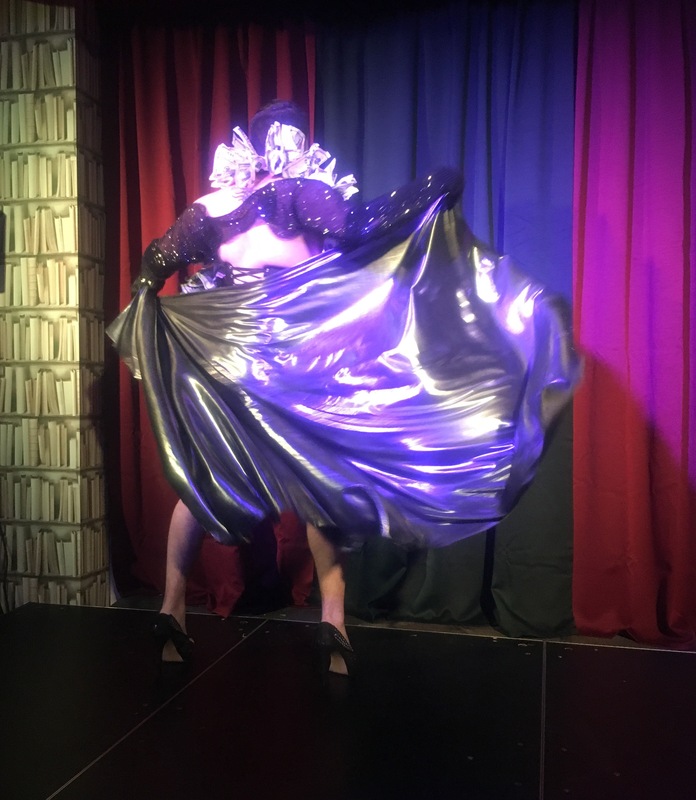 It was another Saturday night in September that my man and I returned to The Shelley Room in North Fitzroy, eager for a night of wonderful entertainment. Both of us had no idea what was in store for us on this evening – the words ‘Snake Oil’ conjure up visions of vintage carnival swindlers and purveyors of fake medicine. 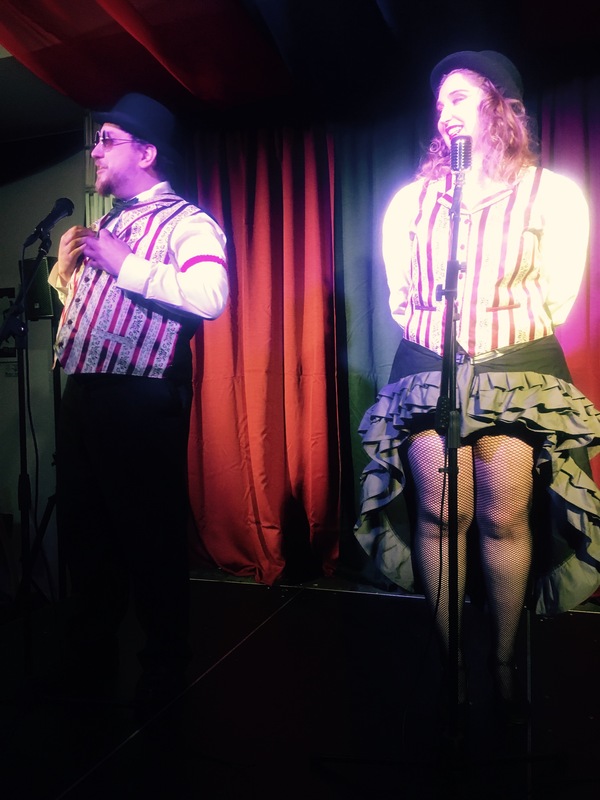 We were wondering just what we were in for, when a pair of performers dressed in what I would regard as vintage carnival styled outfits appeared at the door to let us in – we were intrigued! The show was hosted by that same pair of welcoming performers – Hannibal and Cherri Figjam – who were introduced as brother and sister. If you were wondering if there’s any sibling rivalry happening here well that becomes very apparent during the show (with amusing consequences of course!). Hannibal and Cherri opened the show by singing a parody of the song “I’ve got a dream” from the Disney movie ‘Tangled’ which made my eyes light up as that song is one of my all time favourites! Hannibal and Cherri went to extra effort to make sure the audience was included by pointing to different audience members during the song. It certainly made for an upbeat and positive opening to the show. 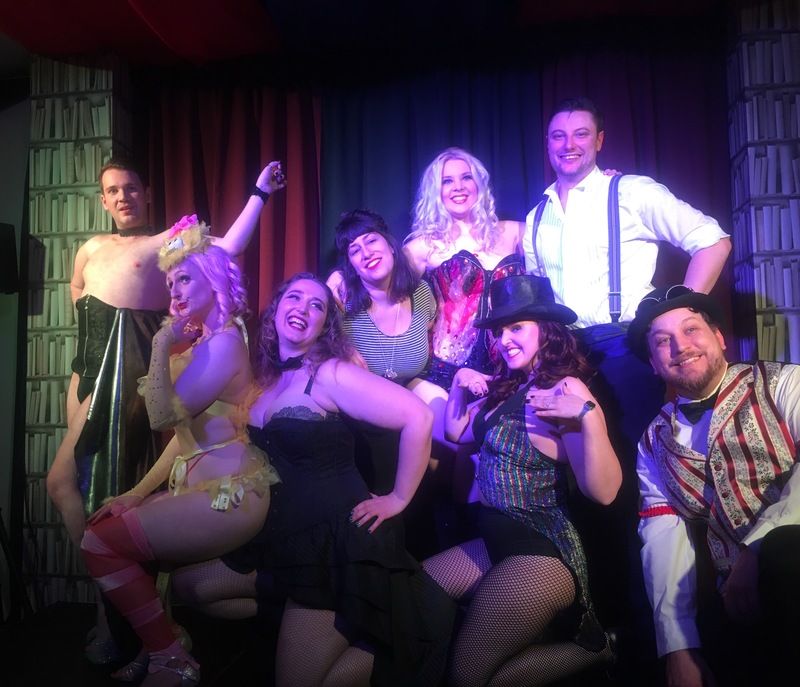 During their introduction, Hannibal and Cherri also mentioned what styles of performance the audience could expect from the show – burlesque, comedy and singing – which made the audience excited for what was to come. The first performer to grace the stage with his fabulousness was Lord Lovat – a star of boylesque. For those who have never seen Lord Lovat grace the stage, then you simply must! He’s a master of tease and you’d be surprised what he can do wearing a pair of heels. A crowd pleaser (and teaser), Lord Lovat thrilled the audience and had everyone purring for more. Burlesque beauty Camilla Cream appeared next with a routine inspired by a god of fertility and wine, featuring some ballet moves. While the theme was classical, let me assure you that this routine held plenty of surprises! The were times when the audience gasped and were held in moments of wonder. Camilla’s playful nature made this performance a total treat. Sandwiched between burlesque routines (lucky him!) was singer and comedian Andrew Iles. I’ve been fortunate enough to hear Andrew sing before, and was delighted to see him take to the stage again. Andrew pleased the audience greatly by singing a parody of the Grease hit ‘Beauty School Dropout’. Aside from his impressive vocal range and the amusing lyrics, his witty rejoinders and facial expressions made his performance shine. The only shame was that he did not come back to sing more – I guess we’ll just have to keep a look out for his future shows! Rounding out the first half of the entertaining first half was the brightly delightful Marilyn Mocktail looking every part the Vegas showgirl. Part dancing, part burlesque and all fun, Marilyn had the audience cheering and clapping along. Part of Marilyn’s charms are her brilliant smiles and cheeky winks. She never fails to put a smile on my face, so if you have the chance to see her perform then please go and see her! At various points during the show, Hannibal and Cherri visited the audience to sing – at times as a duet, and at other times solo (they each didn’t want the other sibling to shine too much!). Hannibal often lingered just off stage, but not so far away that Cherri couldn’t hear his complaints or jibes. 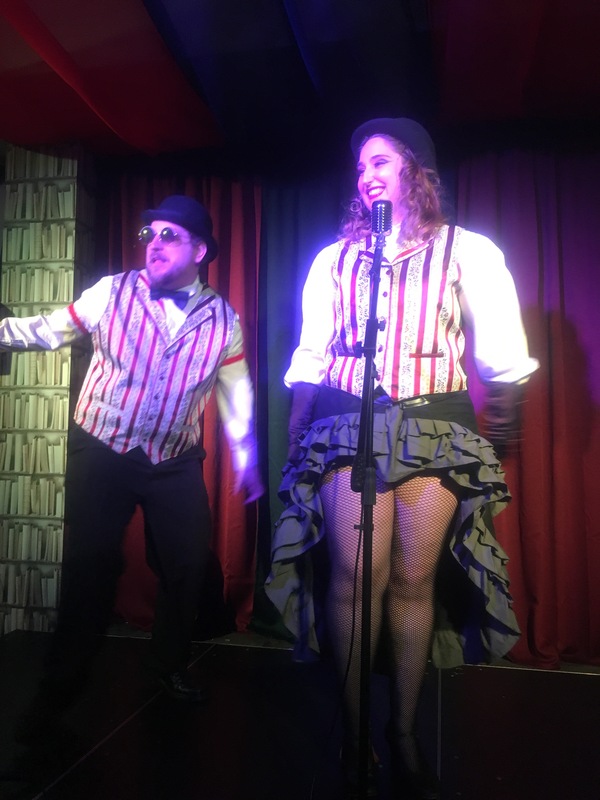 The siblings maintained a playful nature, neither one being too harsh, and it was fun when the audience decided one sibling was giving the other a hard time – resulting in some pantomime style responses! Hannibal and Cherri displayed sweet and tart personalities in equal measure – with a bit of tease on the side of course. 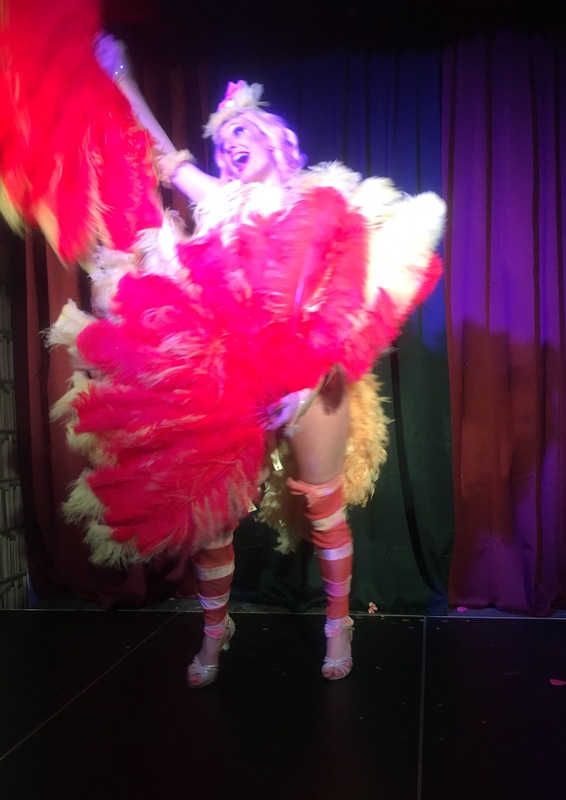 Extra mention of the evening goes to Liberty Foxx (yet another talented burlesque performer) who was the ‘stage kitty’ for the evening, helping to keep the stage neat and tidy in between acts. Liberty Foxx was the sweetest stage kitty and deserves to be recognised too. This was to be the final show held in The Shelley Room (with the producers moving the show to a new location in future) so during the second half of this show, each performer did not hold back and I feel that each brought their own show stopping performances. 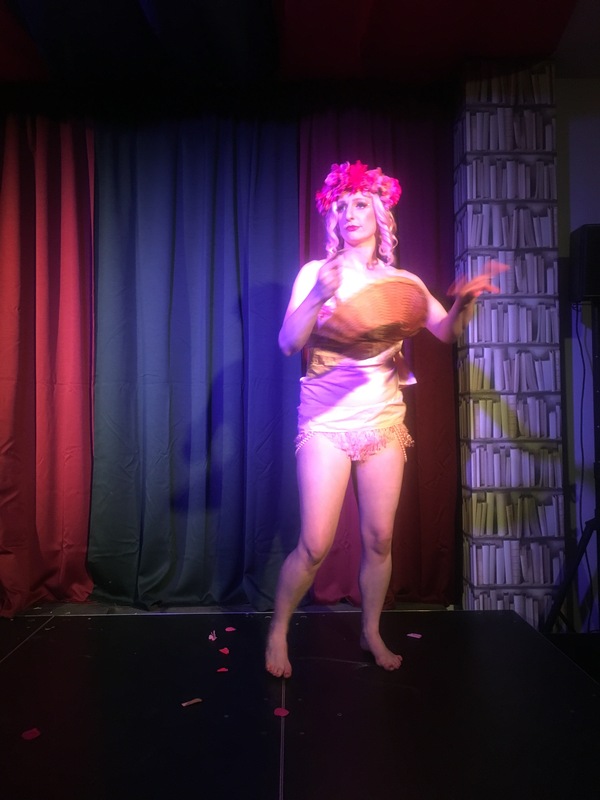 I do not want to give away too much regarding each performance as the burlesque and boylesque performances were top rate and I wish everyone could revel in these performances themselves….however I will provide a tiny taste for you of what went down in The Shelley Room that night! In a Sesame Street inspired routine, Camilla Cream visited the audience as Big Bird – let me tell you that this bird knows a thing or two! 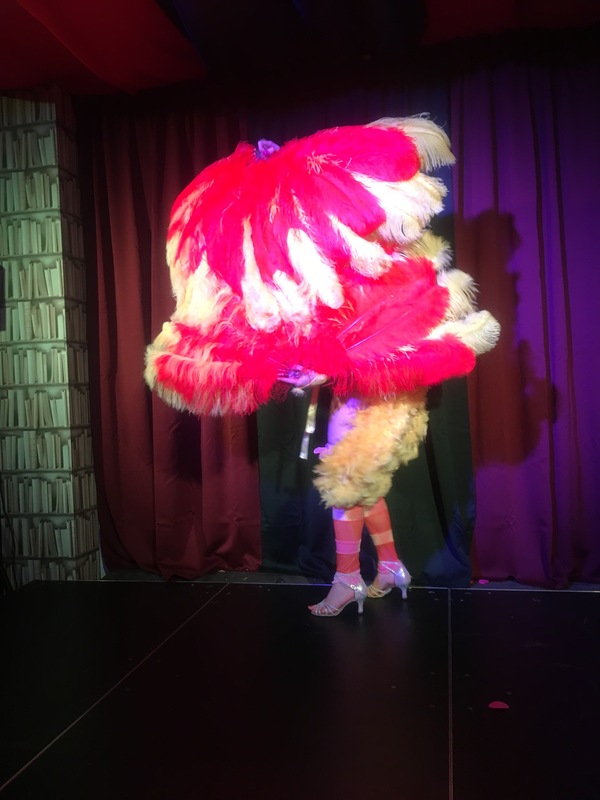 Camilla strutted around the audience and got up to plenty of mischief behind her feathers….she sent feathers flying and hearts fluttering. Letters relating to this performance are the letter O, M and G! I could use the entire alphabet to describe how much I enjoyed this performance, however I’ll leave it at Amazingly Brilliant and Clever. Marilyn Mocktail returned and she was on fire during her routine! Luckily for herself and her audience, they were material flames but Marilyn turned up the heat in the room with her fire inspired routine. I had previously seen teasers of this routine so I was excited to see the performance in its entirety – I was not disappointed! Marilyn shone as she shimmied and danced as flames and then had a costume and song change as the routine evolved. It was a clever and theatrical routine right up to the very end and I loved it. It was one of the highlights of the evening for me. I could see how much effort Marilyn had gone to for every detail of this routine, and that ended up making it so much more special and impressive. 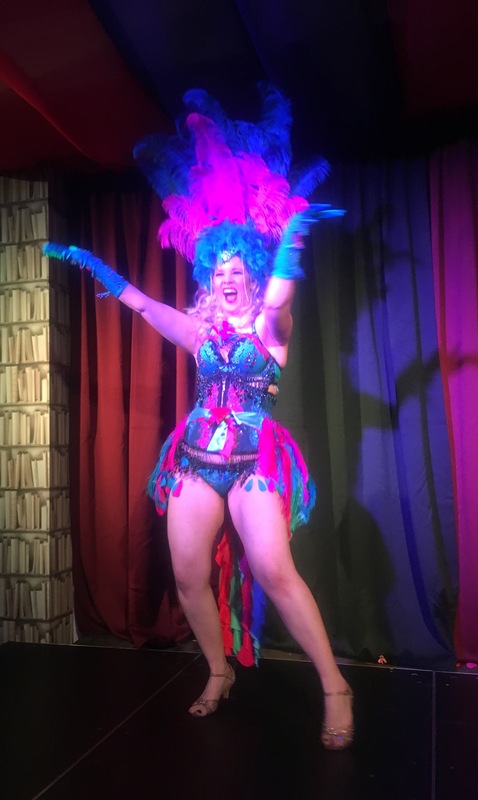 Approaching the end of the show, Eve Ellenbogan appeared onstage and lured the audience away from the world of burlesque and into the land of comedy. 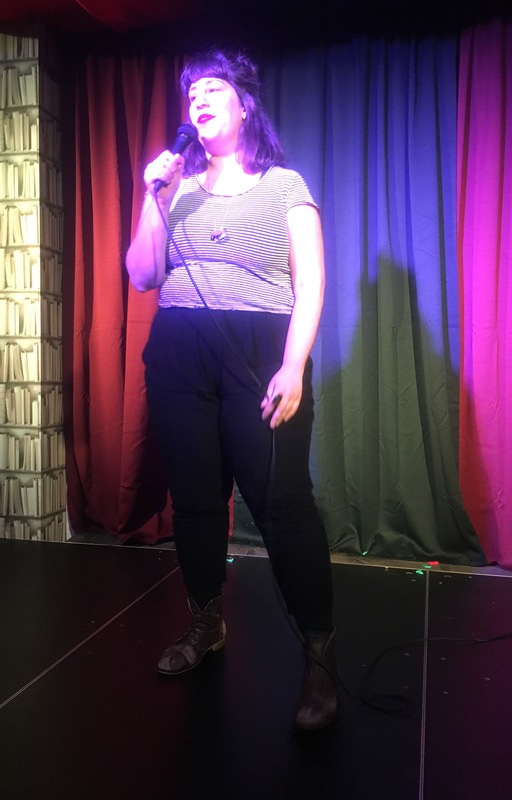 Eve read the audience well (in terms of demographic and background) and recounted amusing tales of share housing and dating – with particular emphasis on her ‘type’. While some jokes bordered on lewd, she held the line well and had plenty of great one liners which the crowd enjoyed. Lord Lovat headlined the evening with his signature boylesque routine – he is so fine and twerked it for all to see! I particularly enjoyed the mixture of slight shock and intrigue on my man’s face as I’m sure he has never seen quite an act like this before! Lord Lovat is by no means shy and many audience members close to the stage were lucky enough to be paid a cheeky visit! Lord Lovat’s performance left everyone on a high, cheering for more. At the end of the evening, it was apparent that The Shelley Room meant so much to the performers and producers of the show. Afterwards, there were many hugs going around and wistful looks. My man and I felt lucky to be in so much lovely company, and to have been entertained so grandly. 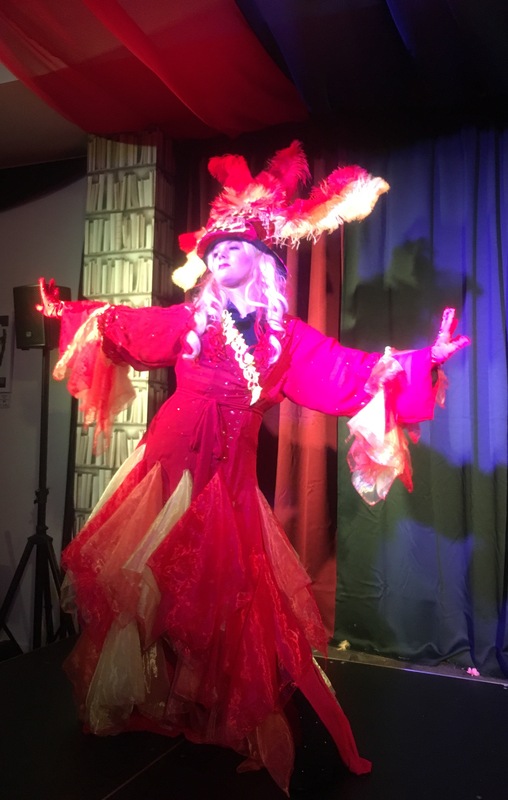 Do keep your eye out for the next venue and show the producers have in store for everyone, as I’m sure this isn’t the last time we’ll hear about Snake Oil Cabaret!